Based on ancient texts (RgVeda, Egyptian, Greek and Biblical) cyclic catastrophism posits that the events currently ascribed to the Cenezoic era, actually took place in the last 6,000 years. The incorrect dating is due to the entire sedimentary crust of the Earth having been blasted from hundreds of volcanoes on Mars between 3687 and 687 BC along with oceans. Therefore the ubiquitous zircons across the world give wide ranges of U-Pb dates from Mars, which is 700 million years older than Earth. 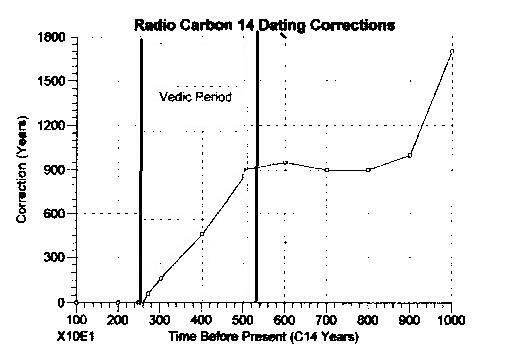 The initial event of this Vedic Period is well documented in ancient texts: as Phaethon scorching the Earth in Greek myth; as Agni , the blazing form of Aditi in the RgVeda and the immediate aftermath in Genesis 1:2 “And the earth was without form, and void; and darkness was upon the face of the deep”.The resulting desiccation path of proto-Venus across Africa and on to the HImalayas is the single most prominent feature on the face of the Earth today (Figure 2). 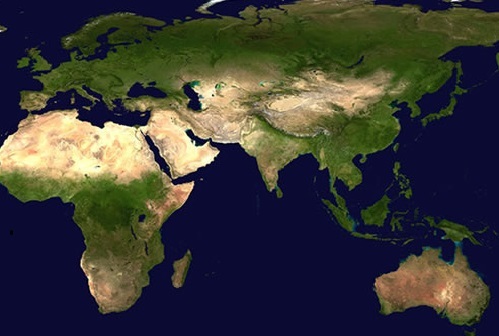 The continuity of the scorched zone across the continents proves there has been no relative motion of Africa and Eurasia since. 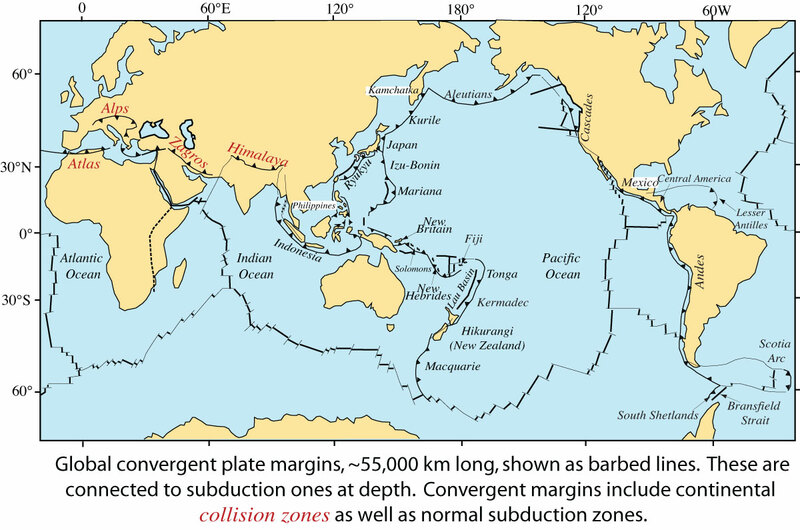 The two close passes of the newly created, molten, out-gassing proto-Venus left behind the iridium spike signaling the K-T extinction, inverted the spin axis of the lithosphere twice within a few centuries, causing the oceans of the world to flow across the continents depositing two tens-of-km thick layers of ocean-bottom material seen today as Mid-Lithosphere Discontinuities (MLD). These released the two pulses of benthic CO2 from deep in the ocean bemoaned above and in many climate disaster posts as a predicted consequence of the present “global warming”. They also explain why there was no arctic ice during the PETM. After these encounters, Proto-Venus gravitationally displaced the living planet Mars, full of vegetation, oceans, atmosphere, from its interior orbit, similar to that of Venus today, into an orbit that intersected that of the Earth. Fig. 3 Orbits of Earth, Mars and proto-Venus between Mars’ geostationary encounters geostationary encounters showing capture and release points. From this orbit Mars was captured in a geostationary orbit of the Earth for 14.4 years and released to the orbit shown for 15.6 years ninety-nine times during which all of its crust, atmosphere, soil, oceans were blasted to the Earth, completely covering the continents. These encounters also changed the atmosphere as shown in Figure 1, and the cycles created the granitic mountains and separated the continents to their current positions. All mammalian life, flowering plants, fruit trees, were introduced early in the Vedic period, 3687, along with Homo Sapiens Sapiens who witnessed and composed the chants that became myths. None of these ‘evolved’ from lower forms. There was no time for evolution. Fig. 1 Atacama images reveal many giant planets forming in orbits of proto-stars. The solar system comprises two fundamentally different types of planets: giants and terrestrials. At present the origin of these two types of planets are not understood. 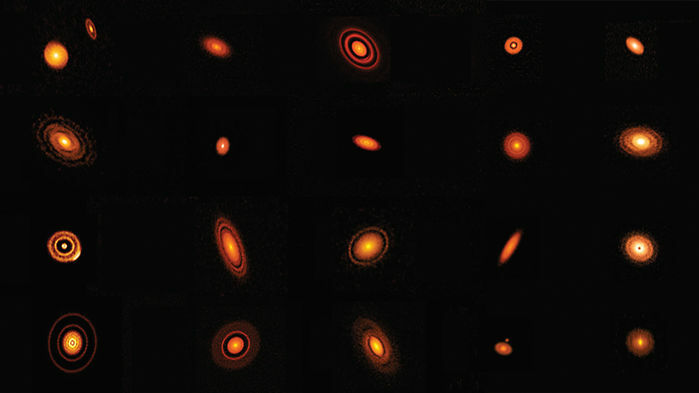 The recent Atacama Large Millimeter/submillimeter Array (ALMA) images of more than twenty very young star systems provide the information to determine the origin and composition of giant planets. At the temperatures of these systems (< 50 K) planets can only form from ices. Methane gas hydrate (MGH) forms naturally at the extremely low temperatures (< 50 K) in the outer reaches of Large Dark Nebulae. In MGH, a clathrate, a dozen or more water molecules form rigid cage-like, Type I, structures. Each cage physically encapsulates a methane molecule but can envelope many other foreign molecules or atoms. Type II cages contain larger atoms or molecules, including Ar, Kr and Xe. The two types are intermixed, maximizing the mass of foreign particles physically, but not chemically, incorporated. The nominal composition of pure MGH is (CH4)8(H2O)46, with an average density of 0.9 g/cm3. Tests have shown that MGH is two orders of magnitude stronger than water ice at 208 K and the difference increases with decreasing temperature.i This strength is further enhanced in highly deuterated MGH. Millimeter studies of Large Dark Nebulae (LDN 1689N, 134, 154, 1544)ii report a 1010 enhancement of deuterium fractionation in the form of ND3 and D3 molecules in their colder outer reaches (20 K). Surfaces of dust particles in dark nebulae act as catalysts for the formation of simple molecules, which then combine forming ices, primarily H2O, HDO, D2O, encapsulating the heavy elements in the form of dust or nanoparticles.iii Accretion continues at the next stage by the formation of deuterated MGH. High deuterium fractionation increases its stability. By this symbiotic process, clathrate giant planets accrete the complete heavy element abundances in nascent stellar systems increasing their average densities to ~ 1.33. Young star systems revealed in the ALMA images are the natural progression of LDNs as they contract and their inherent angular momentum is realized. As observed in the LDNs, high concentrations of deuterium are present in the cold outer reaches of each system where giant planets form before nuclear fusion of deuterium and protons begins in the proto-star. Increasing internal pressure during accretion compensates for later increases in temperature (Fig. 1). Cold hydration makes possible the incorporation of the noble gases, argon, krypton, and xenon as have been detected in Jupiter by the Galileo atmospheric probe. As observed in the ALMA images, the giant planets alone comprise the nascent star system. The MGH composition of giants suggests that they are ~ 85% water. Therefore, the giant planets in the solar system comprise 275 earth-masses of water, explaining that all the icy satellites and rings orbiting the giant planets are due to impacts which ejected material, primarily water into the surrounding space. The author maintains that Juno data is revealing Jupiter is a solid, frozen methane gas hydrate (MGH) planet which incorporates the known solar system element abundances. Its excess luminosity, multiple wind bands and powerful magnetic field are driven by the fusion of deuterium and protons at impact sites on its surface, for example, the larger Shoemaker-Levy 9 fragments. Impacts of asteroids on their MGH surfaces release methane found in the atmospheres of all giant planets. The low density, solid composition, full abundance of elements, high deuterium and water content of the giant planets are ideal sources for producing terrestrial planets. Impacts on these giants instantaneously compress and heat the deuterated surface producing powerful fusion explosions which exponentially increase the energy of the impacts. The heavy elements blasted into the inner solar system by impacts quickly collapse releasing gravitational radiation combined with recombination radiation forming a near-spherical molten core/mantle of the future terrestrial proto-planet, which has no inherent spin. This powerful radiation pressure disburses the more plentiful, lighter elements into the inner solar system. They gradually become captured by the extant terrestrial planets and the new planet when it cools. The natural abundances of the elements in the clathrate giant planets form the lithosphere, crust, atmosphere and oceans of the terrestrial planet. i. W.B.Durham, S.H.Kirby, L.A.Stern, and W.Zhang. The strength and rheology of methane clathrate hydrate. Journal of Geophysical Research, 2003,108, 2182.
iii L.Zhang. Platinum-based nanocages with subnanometer-thick walls and well-defined, controllable facets, Science, 24 July 2015, vol. 349, p. 379, 412.
iv N.J.Habing. Disappearance of stellar debris disks around main-sequence stars after 400 million years, Nature 401, 456-458 (30 September 1999). Fig. 1 Atacama images reveal giant planets forming cold in orbits of numerous proto-stars. New results from Atacama show that giant planets form cold in their planetary nebulae before fusion begins in their star. I have explained this years ago. Quoting from my paper “Evidence for a Solid Jupiter” – February 2018. (See below) As explained in the same paper and in many posts at cycliccatastrophism.org the terrestrial planets are formed by later impacts on the giant planets. As explained in another paper, Venus – A young Earth, The most recent, proto-Venus was formed by an impact on Jupiter 6,000-years BP. These papers are always rejected by the academic ‘experts’ and cannot even by placed on ArXive. usually with 13C slightly enhanced. Tests have shown that MGH is two orders of magnitude stronger than water ice at 208 K, and the difference increases with decreasing temperature.1 This strength is further enhanced in highly deuterated MGH. Infrared studies of proto-stars and Large Dark Nebulae (LDN 1689N) report a 1010 enhancement of deuterium fractionation in the form of ND3 and D3 molecules in their cold outer reaches (20 K). Recent events suggest that the giant planets in the solar system formed in such a dusty, highly deuterated Large Dark Nebula when ices of volatile molecules (H2O, NH3, CO2 and CH4) formed on small dust grains or nanoparticles. 3 Accretion continued at the next stage by the formation of methane Gas Hydrate (MGH av. density = 0.9) enhanced by high deuterium fractionation. By this symbiotic process, Jupiter accreted all the heavy elements in their known abundances in the nascent solar system resulting in its average density of 1.33.
and xenon which have been detected by the Galileo atmospheric probe. 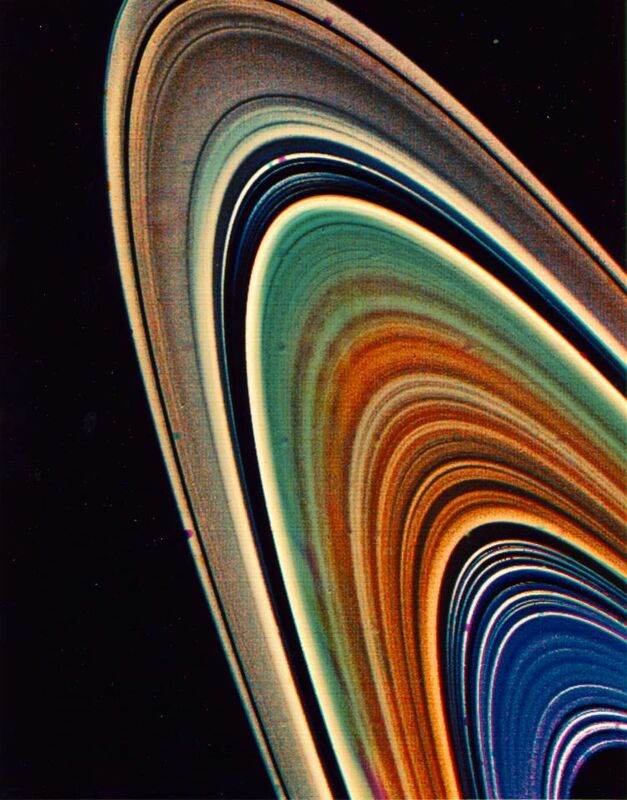 The previous post explains that the rings of Saturn were formed by impacts of bodies blasted from Jupiter, which in turn caused caused fusion explosions on Saturn. •December 18, 2018 • Comments Off on NASA – Saturn Loosing Rings? the planet (Metis in Greek mythology) on Jupiter, was what really got things moving, because in addition to the creation of proto-Venus, this impact left behind a long-term fusion furnace at the impact site (22 ° S Lat) which continues to this day producing the Great Red Spot and driving the excess luminosity, zonal wind bands, powerful magnetic field and continually release the particulate aerosols which produce Jupiter colored clouds and settle to its surface. That fusion blaze originally produced the Galilean moons and added material to them for over five thousand years. But most of the material expanded and cooled forming small condensations moving at similar velocities splatted and stuck together forming millions of 67P/Churyumov–Gerasimenko asteroids, flinging them in all directions due to Jupiter’s fast rotation, slowing it to its current 9.9 hour rate. These currently comprise the main asteroid belt, the Kreutz sungrazers, which produce sunspots and the millions of bodies orbiting Jupiter’s L4 and L5 nodes. Fig. 4. 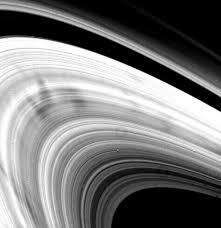 NASA Cassini probe imaged ‘spokes’ showing material being blasted from Saturn into the rings. Unfortunately, Saturn was just the poor (solid highly deuterated methane gas hydrate) guy next-door to the big bully Jupiter and was continually bombarded with these 67Ps, each of which caused fusion explosions on Saturn’s surface, just as Shoemaker-Levy -9 did on Jupiter. The gases ejected by these impacts for the last 6,000 years have expanded the atmosphere giving Saturn’s apparently low density, whereas it is really the same composition as Jupiter. The larger, more frequent impacts formed the rings of Saturn, beginning 6,000 years BP, but continue to contribute mass to this day, because many 67P s are still invisibly zooming in orbits of the Sun. 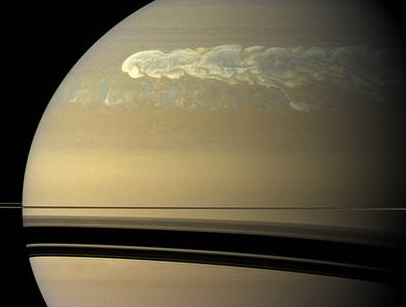 The impacts on Saturn are occasionally seen by Earth telescopes when their ‘mushroom’ clouds appear at the cloud tops and the ejected material has recently been observed as shadows or impacts on the rings. The falling ring material will become part of the atmosphere. The Earth was completely re-formed and mankind created amid recent solar system chaos. The state of everything in the solar system we observe today is a result of cyclic catastrophism. No feature on any planet is older than 6,000 years, indeed Mercury, (Sarama, Hathor, Hermes) was first revealed and Venus born about 3687 BC. Uranus and Neptune have been bombarded during this period by Jupiter, resulting in their current atmospheres. The astronomical ages imagined and enforced by academia are needed to allow for evolution, which never occurred on Earth. In Greek myth Zeus turned his wife Metis into a fly and swallowed her. This gave him such a terrible headache that he had Hephaestus, the handyman or blacksmith deity, split open his head and the incandescent Pallas–Athene (proto-Venus) was born in “full battle dress”. 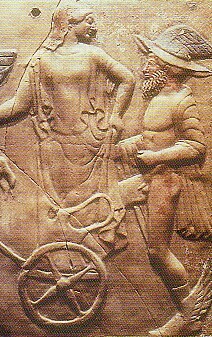 Roman myth adopted the Greek version, naming proto-Venus Minerva. Egyptian myth initially named proto-Venus Osiris. In the RgVeda, Aditi was born from Daus–pitar, the heaven father, the brightest planet high in the heaven, by his maya or secret power. All myths of this impact have in common the statement that ‘the Earth cried out.’ Both the Metis and the maya version of this myth are consistent with the impact of a cold planet sized body impacting Jupiter, since a body the size of a terrestrial planet would not have been visible from the Earth. Aditi (A–diti meaning Un–bounded), rampaged throughout the inner solar system having many battles with Indra (Mars). In the RgVeda proto-Venus was given different names depending on the circumstances of the moment: in daylight along side the Sun, Surya (Sun maiden); in the night sky, Pusan, guardian of the traveler; when approaching Earth and scorching a wide path from the Sahara to the Himalayas, Agni (fire); and after a thin crust formed, Mitra/Varuna. The combined aspects of the rampaging proto-Venus were described as the Adityas, ”sons’ of Aditi”, but the RgVeda adds a caveat “the wise man knows what is one is called by manifold names”. In Mesopotamia, proto-Venus was Inana/Ištar (Sumarian/Akkadian). Approximately six thousand years (~4000 BC) after the first two inversions of the Earth’s lithosphere, an enormous impact on Jupiter, probably the planet-sized body from which Earth had captured the Moon during the Younger Dryas, produced an incandescent plasma cloud at least a thousand times the size of the giant planet itself which rebounded into the inner solar system, contracted, becoming the star-like proto-Venus. That impact explosion was observed by all ancient cultures and is part of their mythologies, but the dark impacting body could not have been seen. The reason that the impact was observed by all cultures is stated in all of the above myths, which claim that “the Earth cried out”, alerting all people to search the sky. Although no sound could have propagated across more than 500 million km to the Earth, gravitational impulses also travel at the speed of light through empty space, thereby revealing the great power of the impact event. In this case it was due to the mass of proto-Venus being instantly blasted from Jupiter into the inner solar system. A small amount of heat from this impact explosion, currently being re-radiated back to the Earth isotropically from galactic dust particles, is a confirmation that this event occurred in the solar system. In addition, several alignments of the radiation field with the solar system, facetiously named ‘the axis of evil’ and a 2% decrease in its power in the ten years between the WMAP and Planck measurements have nullified the big bang hypothesis. Despite the obvious problems, cosmologists now claim that this “big bang” has replaced God. Proto-Venus’ birth, 6,000 BP, described consistently in all major myths, confutes six major tenets of academic science, that: (a) Jupiter and the other giant planets are highly deuterated, solid, methane gas hydrate (MGH); (b) each terrestrial planet was formed by similar impacts on Jupiter at quite different dates based on the ages of native rocks, Mars 4.6 Ba (billion years) and Earth 3.9 Ba; (c) because MGH is a clathrate, Jupiter physically encapsulates the full range of known element abundances in the solar system, indeed, these abundances originated from Jupiter; (d) proto-Venus is a hot, molten body comprising only the heavy elements which will become its core and mantle; (e) the more abundant lighter elements ejected by the impact explosion have not been able to settle on its surface due to its high temperature, 864 F.; (f) The giant planets alone formed the solar system, the age of which cannot be determined. 6,000 years ago Mars was in a Venus-like orbit with plenty of sunlight, oceans and was full of life. Proto-Venus was created by an explosive impact on Jupiter and raged into the inner solar system with excess kinetic energy. 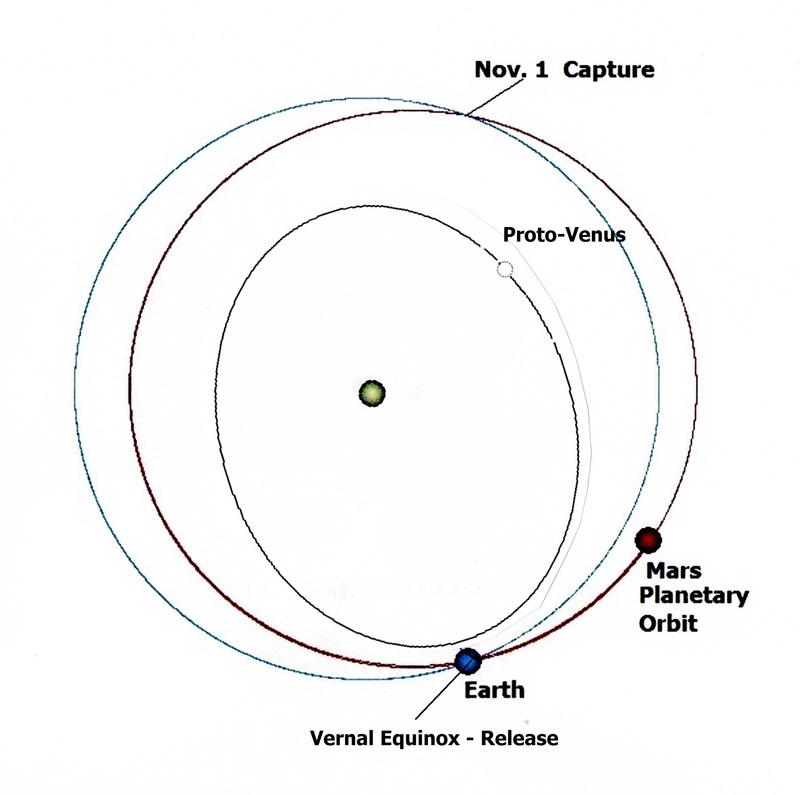 It exchanged orbital energy with Mars, bringing Mars into an orbit that intersected that of the Earth (Figure 1). Mars approached Earth (Nov.1) on the night side when Mt. Kailas (31° N Lat. ), the gravitational focus of the Himalayas, was 36 ° above the ecliptic. The Himalayas, which acted as a handle of the entire lithosphere, became tidally linked to Mars, forcing the lithosphere of the Earth to rotate more slowly with Mt. Kailas remaining in the ecliptic plane and Mars directly above in a geostationary orbit for each 14.4-year encounter. This is how captures occurred with angular momentum and kinetic energy conserved. 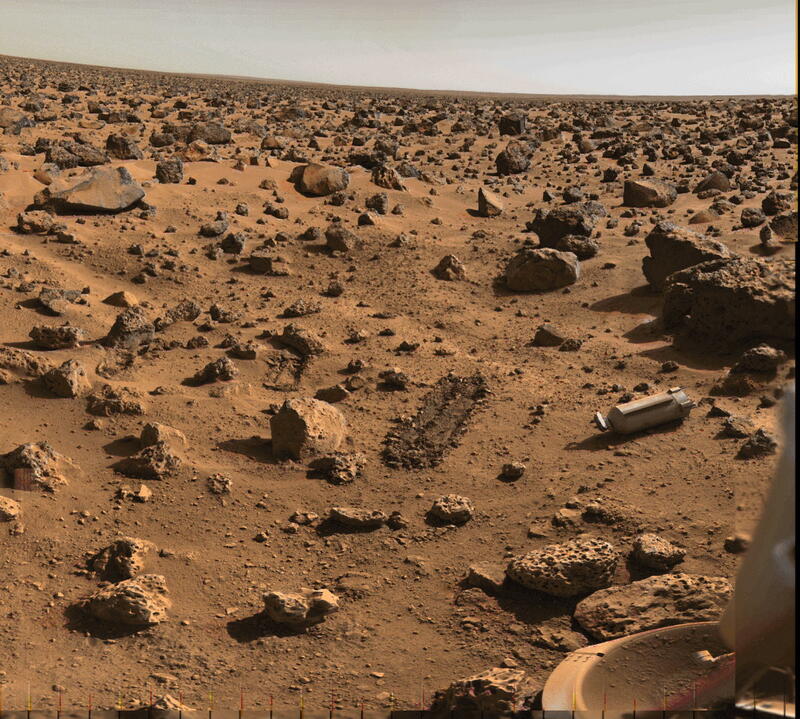 They were restored to Mars at each release of 15.6 years, allowing a total of ninety-nine cycles of 30- years. 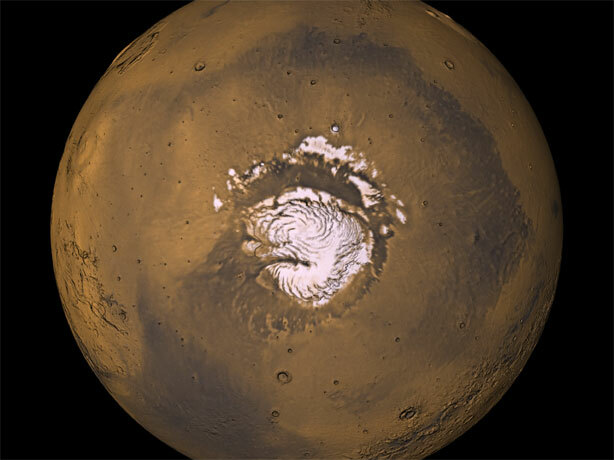 Fig 4 Mars northern island covered with last maelstrom, surrounded by sedimentary deposits from the northern ocean. Fig. 5 Viking 2 site, 48 N Lat. surrounded by scoria from collapsed lava column at north pole. northern third of Mars (Figure 5). As on Earth, the motion of the lithosphere relative to the interior provided unlimited lava for hundreds of volcanoes in Mars northern hemisphere which blasted rocks, soil, saline water, atmosphere, and vegetation to the Earth when alignments with the Moon or with the Moon and Sun combined, caused convulsions within Mars. This explains the fact that the northern third of Mars is now 7 km below the datum. Moon alignments occurred potentially every fifteen days when the inclined orbit of the Moon crossed the ecliptic. This rock, soil ( & zircons), water, atmosphere and vegetation (as manna, Soma, haoma) now covers the entire Earth. 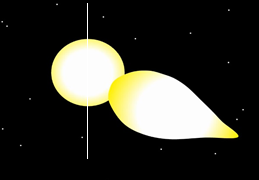 Venus, in its eccentric interior orbit (Figure 1) reached aphelion and inferior conjunction every 30 years on the vernal equinox of the fourteenth year of each capture period. The alignment of Venus with Moon and Sun, caused enormous convulsions shattering the hardened lava column and exposing the large volcanic vent in the northern island which fed the great column. 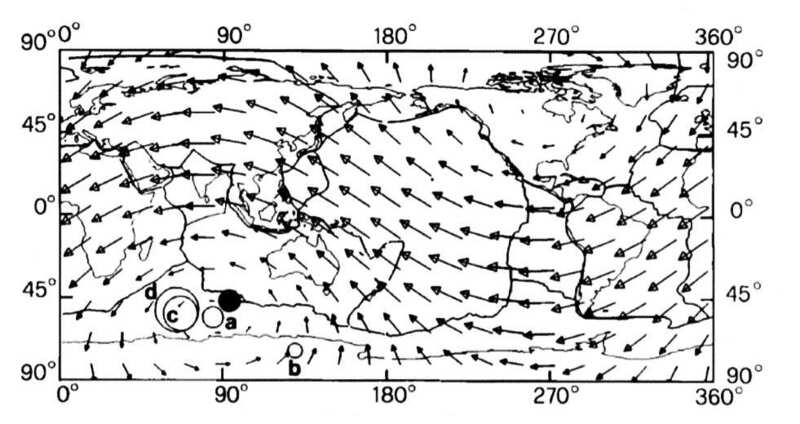 The indirect tidal forces of the three combined to raise the northern ocean above the island, which then cascaded into the deep vent as a whirlpool or maelstrom (Figure 5) and flashed to steam. The pressure opened the 4,000-km long fault, called the Valles Marineris, forcing the solid iron core out, first as the “eye of Ra”, but it continued out as an independent body Hathor, one third the mass of the ancient Mars. The core’s ejection, to the east, reduced the orbital velocity of the outer shell of Mars which started to drift to the west leaving its geostationary orbit. 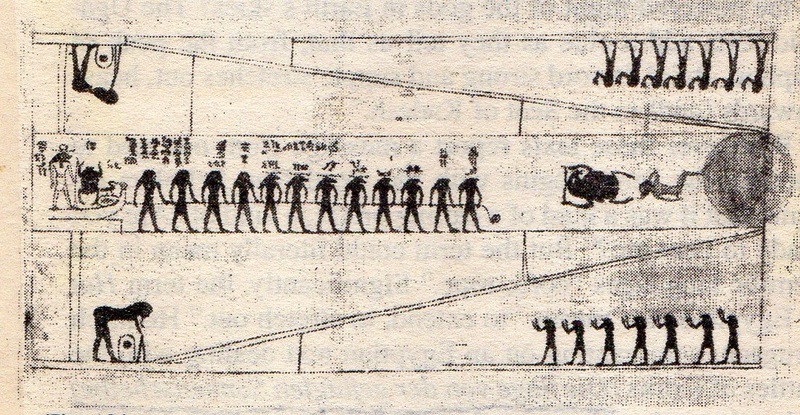 The solid core, also called Sarama (RgVeda), Hermes (Greek), Mercury (Roman) and The Sun Star in Hebrew Tanakh, zoomed low around the Earth to the East in a slingshot maneuver, “killing men in the desert”, caught up to the shell in eight days and reentered the gap before Mars attained its holding orbit (Figure 1). Each complete cycle, capture and release, occurred ninety-nine times. These spectacular releases were observed by everyone on Earth and are celebrated by every culture in the world as eight day or nine night festivals beginning on the vernal equinox. At the end of the last encounter, 687 BC, the solid core was deflected by Venus so did not reunite with the shell. The shell contracted to become the present diminutive devastated planet Mars which we currently waste billions to ‘explore’. The solid core, now called Mercury, interacted with Venus for several centuries (Figure 6) and then both settled into their current orbits, where planetary scientists believe (and teach) they have been for 4.6 billion years! In the Bible the planets involved were termed sinning angels and although He used them to perform this greatest miracle, were sentenced by Jehovah, not to Hell as told for Lucifer (Venus) in Isaiah 14:15, but as stated in the the Greek Septuagint, to tartarus, places of restraint, that is, their current orbits, no longer a threat to the Earth. Mars is the collapsed outer shell of a planet that was full of life 6,000 years ago, all of which was blasted to the Earth and completely covers the Earth. Lithospheres with raised mass anomalies rotate independently of their mantles due to the tidal drag of a nearby planets. Jupiter is a solid highly deuterated Methane Gas Hydrate (MGH) planet with the full complement of known element abundances. Explosive impacts on its surface produce the terrestrial planets. The fact that MGH is 80% water explains the origin of water on Earth except that blasted to Earth from Mars. Isaiah 65:17 (KJV) For, behold, I create new heavens and a new earth: and the former shall not be remembered, nor come into mind. Fig. 1. Egyptian drawing of the solid iron core ready for ejection from Mars through what they called the ‘double doors’, the Valles Marineris. Mars was full of beautiful life forms as recently as 3687 BC and was in a Venus-like orbit with ample sunlight. At that date it was deflected by proto-Venus into an orbit crossing that of the Earth. From this orbit It was repeatedly captured in a geostationary orbit of the Earth for 14.4-years and released for 15.6-years on the vernal equinox by the alignments of Venus, Moon and Sun. This 30-year cycle was repeated ninety-nine times. During this Vedic period all the life resources of Mars were blasted to the Earth by convulsions when it passed through alignments with the Moon or the Sun and Moon combined. Mars escaped this orbit each time when the solid iron core was ejected. It zoomed around the Earth to the East in a slingshot maneuver and caught up to the shell of the planet which drifted west over the Middle East with a gaping hole and caught up to it in eight days and reentered. 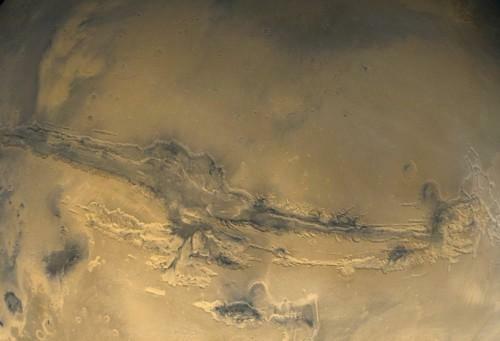 The solid core exited and reentered through the Valles Marineris. At the last encounter the solid core was deflected by proto-Venus and did not recombine with the outer shell, which then collapsed in on itself and is now the diminutive Mars,only a shell of its former self, and entered its current distant orbit only 2,700-years ago. The solid core interacted with (still) proto-Venus and the two, currently called Venus and Mercury, settled into their current orbits. As a result, the vegetation, rock, soil, salt, atmosphere, oceans on Mars in 3687 BC were completely blasted to the Earth, leaving Mars a desolate place. The search for microscopic life and the idea of terra-forming Mars are ludicrous. The Valles Marineris will surely show signs of the tens of ninety-nine ejections and reentries, extending from the surface deep into the liquid core. Due to over ten thousand convulsions there will be much more heat coming out of Mars than expected. Unfortunately, evolutionist academia wants you to believe the entire solar system is 4.6 billion years old, so they continue to interpret all data from the planets in these terms. That is why they cannot interpret Pioneer Venus and Juno data. In the Pepi I Meryre (“beloved of Ra”) funerary epic the Valles Marineris was termed the “double doors” and states specifically that it took eight days for the core (Hathor) to close the distance and recombine with the shell. This was observed by ninety-nine generations of mankind. The Egyptians celebrated these releases with the Sed Festivals, every 30 years. The passing of the shell over the Middle East at each release was the origin of the Jewish Passover, which is celebrated at the vernal equinox for eight days. The Vedic Aryans celebrated a nine-nights festival and the Persian new year Nowroz, (nine nights) is also celebrated at the vernal equinox.